I came across this watch for sale, described as a " 1940's Breitling, 38mm". I'm clarifying with the seller if the size includes the crown. There aren't any movement pictures, nor pictures of the inside of the caseback, and I've asked the seller for them. Will post once I get them. OK so it doesn't look like the cleanest case around, and it'll need a service, but the dial seems legit (has patina and possibly not a redial?). The crown looks like a different colour though. Crown aside, is the rest of the watch legit? Or is it a franken or outright fake? Thoughts or opinions will be helpful, thanks in advance! Last edited by nt931 on Sat Oct 31, 2015 12:49 am, edited 1 time in total. so quite a lot doesn't add up. Cool, thanks Fred! Will avoid this one! I think this is one of those reutilized cases. Look closely at the spacing on the ref number and you can see the 1 appears to be added later. The ref 781 is about 38mm. We've seen these modified reference numbers before in the early 1950's on 1940's cases. Asking price is optimistic though. that might be correct, so u think it's a 781 with a V188 instead of the Venus 175 in the 40s Premier. could well be. Yes, if it's got the V188, properly signed, inside I'd be leaning towards it being correct. I am reviving this thread to try and get confirmation from 781 owners. I have a Premier 781 with a case from 1946 (serial# 674xxx). The dial looks very similar to Fred's 781 above from the late 1940's. However, mine says "Geneve" on the dial. So I must have a 1946 case with a 1953 (or later) dial. 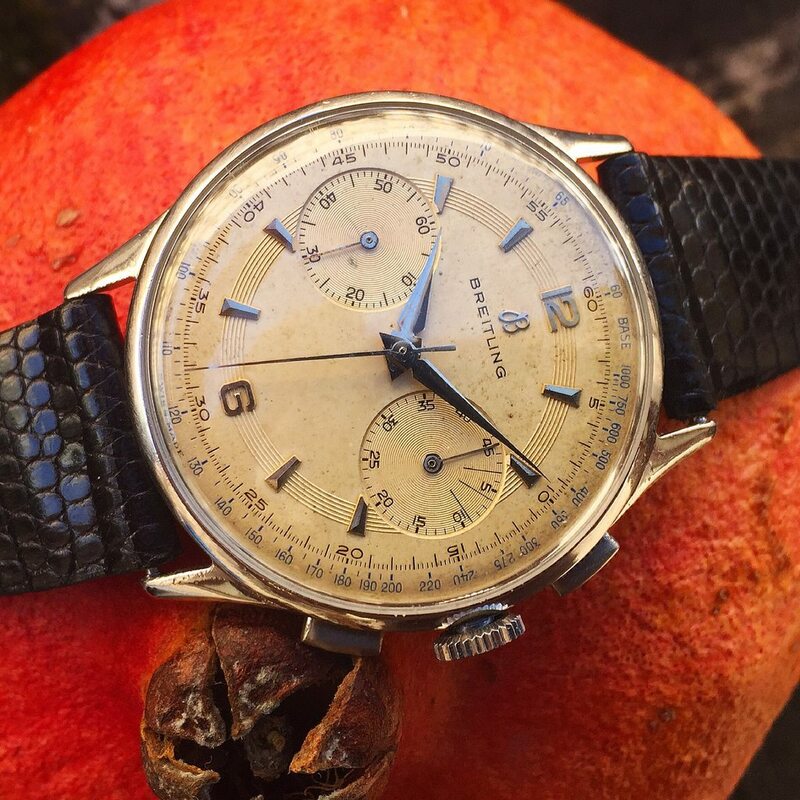 From this thread, it appears there is a general consensus that Breitling assembled and sold a number of 781's in the early 1950's using older cases. So that makes me believe mine is a correct piece. However, one commentor above says he would expect a 781 from the 1950's to contain a Venus 188 movement (like the Cadettes of that period). Mine has an unsigned Venus 175, like you would expect to find in a 1940's 781. So here's my question: can anyone with a 781 with a 1950's dial and a 1940's case confirm the movement inside? My theory (or "hope" ) is that these transitional 781's must have Venus 175 movements. In fact, I'll even speculate that my chrono is proof of that, because if Breitling made these later dials to fit the Venus 188, how could mine be married to a Venus 175 and function properly? Of course, my theory is garbage if the same dial fits both the V175 and V188! They are both 14''' movements, so its possible...anyone happen to know if they do? Last edited by Rex Lex on Fri Jul 28, 2017 6:44 am, edited 1 time in total. Nevertheless , chrono bridge was not engraved on pre 1945 versions but would be engraved on a post 1952 version. Point noted. However, if the movement (like the case) is from 1945/46, then it may not be signed. So that begs the question: on these 1950's chronos with "re-utilized" cases, is it only the case that is re-utilized, or both the case and the movement? It certainly seems possible that they were utilizing old stock cases AND movements....just sticking new dials on them. If anyone has one of these, I would love to know what the movement looks like. I think that photo caused an illusion. All the hands are gold. Last edited by Rex Lex on Fri Jul 28, 2017 6:47 am, edited 1 time in total. This watch is certainly frustrating. I cannot find anything 'wrong' with it, other than the word GENEVE on the dial. If this watch were exactly the same, minus GENEVE, I believe there would be no question that its an authentic 1946 Premier 781. The case and dial are clearly that of a genuine 781. And that's clearly a genuine Venus 175. However, GENEVE is there. So what does that mean? Here is another one of these transitionals. This time in a Ref. 760 case from 1945, but with a signed bridge on the Venus 175 and "Geneve" on the dial. Any argument this isn't genuine? First one I have seen with a 760 case, but appears to be very similar to the 781's discussed above. dial, hands and movement signature look correct for mid 1950s - and we know Breitling used their case stock over years.